Jerusalem is a holy city to three major faiths–Judaism, Christianity and Islam–and figures prominently in the Arab-Israeli conflict. 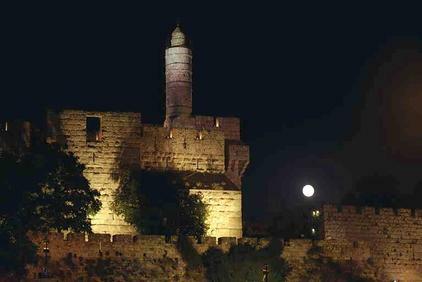 Since 1004 BCE, when King David established Jerusalem as the capital of his kingdom, there has been a continuous Jewish presence in Jerusalem, the holiest city in Judaism. Following the building of the Church of the Holy Sepulchre and the designation of other holy sites by Constantine the Great in 333 CE, Jerusalem became a destination of Christian pilgrimages. During Umayyad rule from 661 to 750 CE, the Dome of the Rock and the Al Aqsa Mosque were built on the site where the Jewish Temples had once stood, and Jerusalem became the third holiest city in Islam. Since 1967, Jerusalem has become a focal point of the Palestinian-Israeli conflict. In 1980, Israel passed the Basic Law: Jerusalem Capital of Israel, reaffirming the unified Jerusalem as its eternal, undivided capital. Palestinians insist Jerusalem must be the capital of their intended state. The Illustrated Map of Jerusalem, Dan Bahat, 1989. Atlas of the Arab-Israeli Conflict, Martin Gilbert, 1993. Freedom of Religion in Jerusalem, ed. Ruth Lapidot and Ora Ahimeir, 1999. Israel's Foreign Relations: Selected Documents, 1947-1974, Ed. Meron Medzini, 1976. Whose Jerusalem?, Terence Prittie, 1981. Jerusalem: An Archaeological Biography, Hershel Shanks, 1995. Select from the left-hand menu for more details.